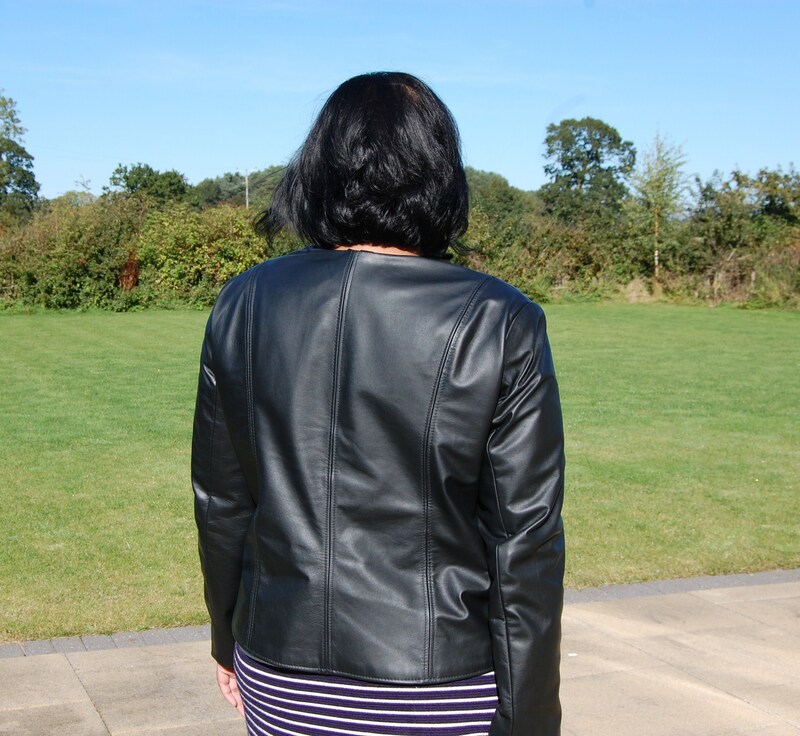 Today is a picture/ information heavy post about Butterick 6169, which I made using real leather. Yep. I made a jacket from REAL leather. I got over my fear of wrecking the most expensive “fabric” I have bought to date, and of sewing leather, and today I am going to share my experiences with you. The leather was purchased from a shop in Newcastle called Le Prevo Leathers. I highly recommend these guys. I went into the shop thinking I would buy nappa leather, because isn’t that what all leather jackets are made of? But the guy in the shop told me straight away that nappa isn’t the easiest leather to start out with and on reflection he was probably right. Instead I walked out with 2 cow hide skins, each of around 20 square feet. I took my pattern pieces with me and we laid them out roughly to determine how much leather I would need. He also sold me some specialised leather sewing thread. I wish I could tell you exactly what this thread is, but I don’t know what it is called. All I know is that it is much, much stronger than even a heavy duty topstitching thread and gives all the top stitched seams a very professional finish. Use leather specific needles. I used Schmetz. I only ended up using 2 needles for this project (first one bent). Use the right machine foot. I used a walking foot throughout. I started off using a teflon foot but the lower piece of leather next to the feed dogs was stretching out too much. The walking foot eliminated this problem. Use a longer length stitch to sew and topstitch. I used 4.3 on my Janome machine. You can use heat on leather. But use with caution. Test first and always use a press cloth. By the same token, you can interface leather (and should where appropriate). Again, always use a press cloth. You cannot pin into leather. 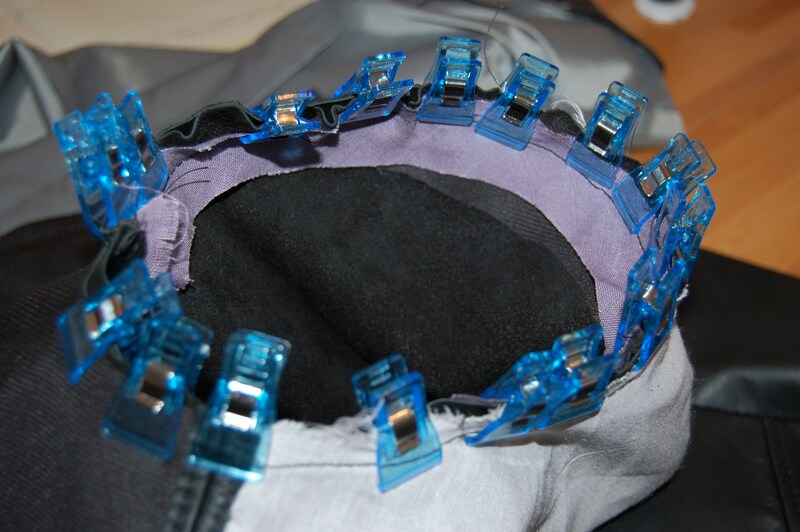 I bought 20 of those quilting clips and they were perfect for holding the leather together whilst sewing. See below. The part of this jacket construction I was dreading the most was the setting in of the sleeves. You cannot ease in a leather sleeve using the traditional gathering of the sleeve cap method. I used the “sleeve head” technique from Jackets for Real People (an invaluable text IMHO). Essentially this involves sewing a bias strip of, in my case, linen, to the sleeve cap to take up the ease before sewing the sleeve into place. The result was a painless easing in of the sleeves. Check it out below. 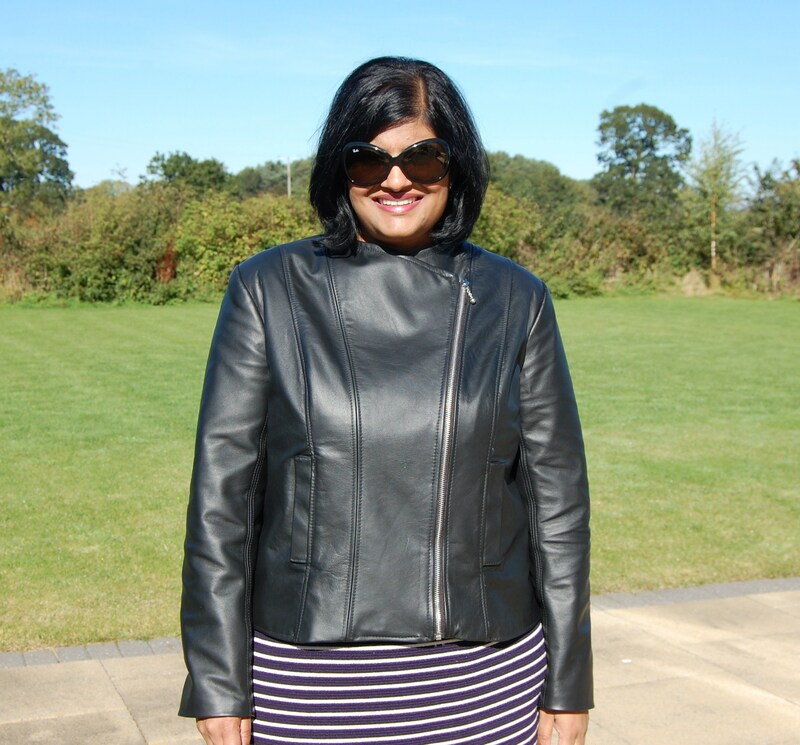 Butterick 6169: DIY Black Leather Collarless Biker Jacket – using quilt clips to hold leather sleeve in place before sewing. The linen is my “sleeve head”. 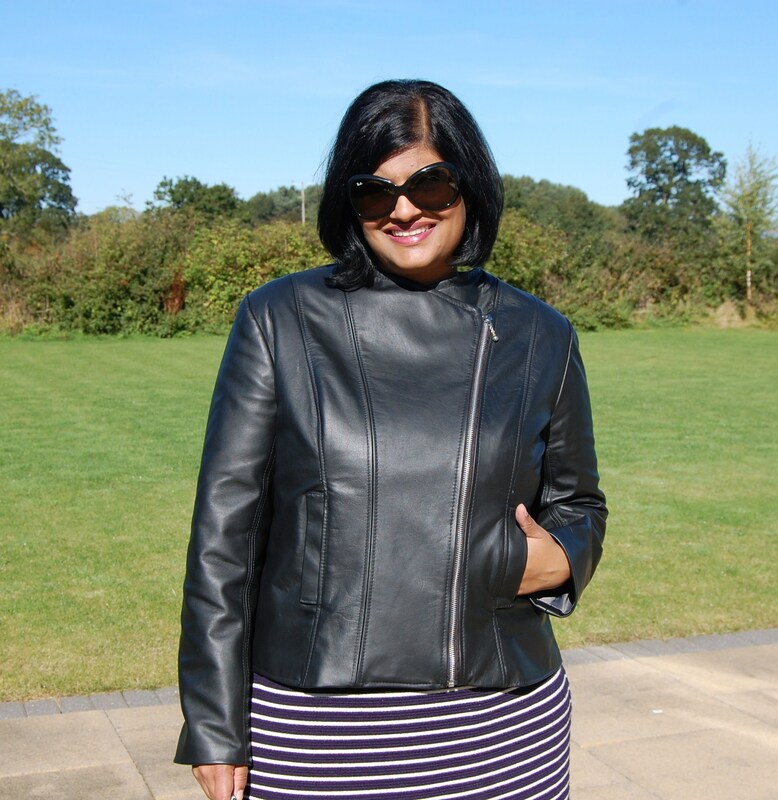 Butterick 6169: DIY Black Leather Collarless Biker Jacket – sleeve sewn in place using linen sleeve head to take up ease before setting in. I treated the inside of this jacket a little like a tailoring project. 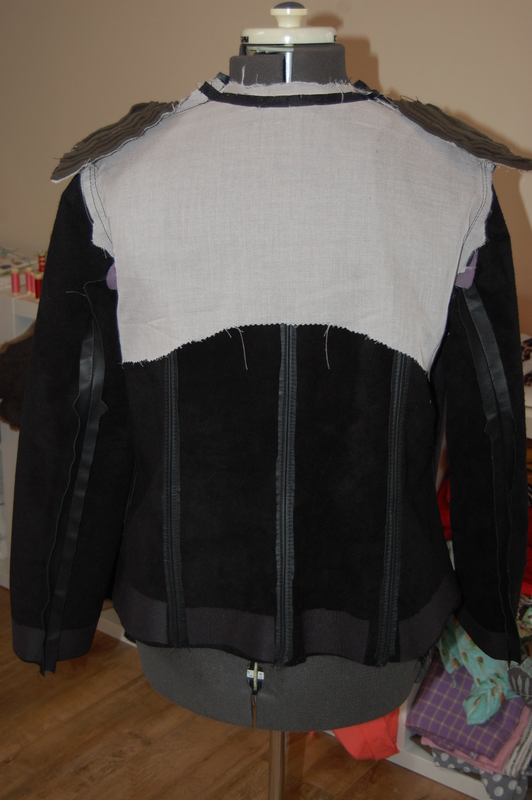 I added a backstay, interfaced the hems, interfaced all of the front of the jacket (the pattern does not tell you to do this), catchstitched stay tape (to the backstay) around the back neckline and made my own shoulder pads. As you can see I ended up topstitching virtually every seam. The jacket is fully lined with a bemberg twill lining. It is a little heavier weight lining which is a good pairing with the leather. I also added a leather hanging loop. In retrospect that was a little bit of an error. It is a little bulky, but the leather has already softened down and I think it would have been more of a mistake trying to remove it (remember, leather shows any unpicking you do!) 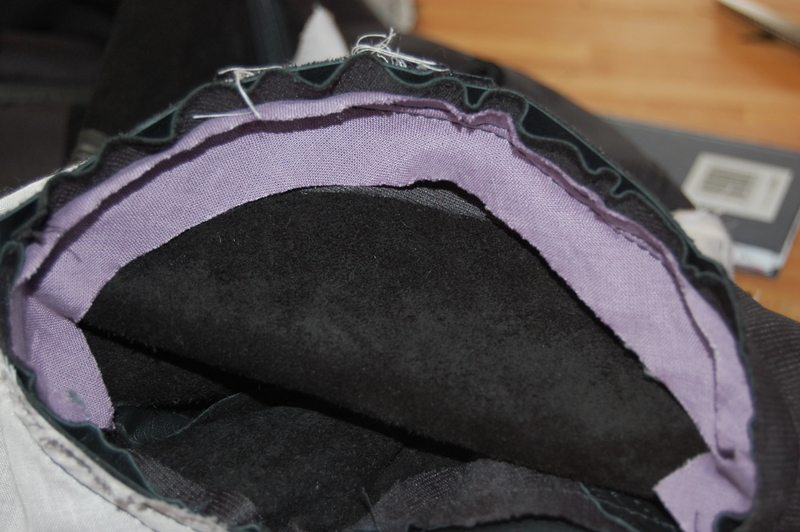 I bagged the lining out: again, hand sewing leather…nahuh. *EDIT: if you are picking a pattern to sew in leather then make sure you can complete the pattern with NO hand sewing and also consider if there are any areas where they are lots of layers. My janome handled this project with no fuss, but the one part it didn’t like was topstitching the front edges through all the layers/ zipper tape etc. It did it…but just something to watch out for. 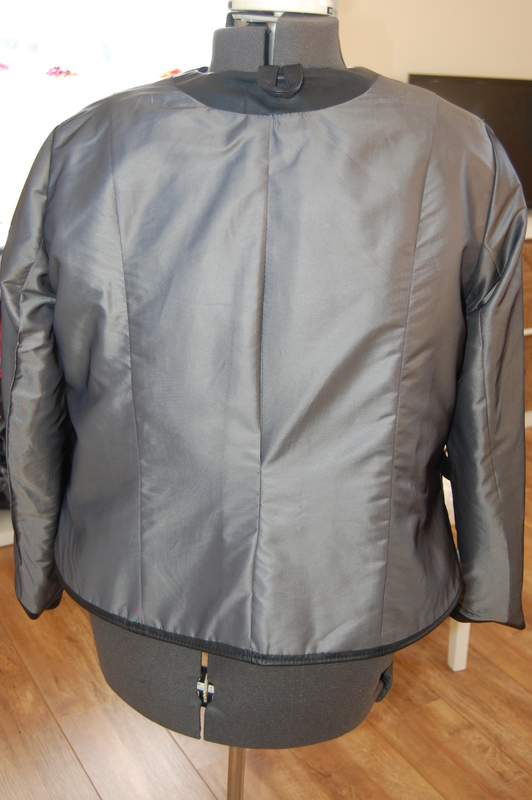 Semi-fitted, lined jacket has shoulder pads, seam detail, welt pockets, exposed zipper, and two-piece sleeves. Loose-fitting, pullover dress (semi-fitted through hips) has bias neck binding, self-lined yokes, princess seams, side-front pockets, shaped hemline, wrong side shows, and narrow hem. B: Attached belt. Yep although I did a lot of my own thing. This review is only for the jacket. I love the finished jacket. It is simple but classic whilst still on trend and very well drafted. I love the two piece sleeves. If I made this again, say in a boucle or a linen, I would definitely add in zippers to the sleeve openings. Nothing to dislike. Garment cow hide leather. I used 2 skins of 20 square foot each. The jacket is fully lined with a bemberg twill lining. One thing I should point out: the front of this jacket (where the zipper is) should be slightly longer. Somehow I messed up when sewing in the facings and so this part of my jacket is maybe 0.5 – 1 inch shorter than it should be! Yes, annoying, but that’s the consequence when you are working with an unforgiving fabric like leather. Wow, your jacket looks fantastic, thanks so much for sharing. I’ve got a cream cow hide myself, which was very cheap but which I got put off making up as I’d heard you need pigskin for good quality garments. However your jacket looks so great I’m inspired to make something with it now. Maybe not a jacket, as I already have a leather one already, but a skirt, maybe, or if I’m brave trousers. Thanks…what is your name anyway?! I hope you do make something with your leather. I have just been nosing through your blog and I am sure you will be able to handle it. that is absolutely fantastic, great fit, great sewing and you look so sharp. Love it! I love it! I have some suede leather that I want to make a jacket with but I’m too scared of ruining it! Thanks Jenny. You should totally do it! Amazingly beautiful. You did a wonderful job. Thanks Sam. I take that as compliment 🙂 yes I already clocked a vogue skirt pattern in their new release which I would like to do in leather. WOW! Just WOW! I may just tackle a real leather bag one day. I don’t have a walking foot yet, and know I need to get one. Thanks for sharing your tips! WHAT!!?!?!?!?!?! Amazing. Just so cool. I love it I love it I love it! 🙂 I’ve been wanting to sew up a faux version of a leather jacket. I love the look, and it fits you so well. Thanks kathy. I could totally manage real leather. Wow, you did a fantastic job! 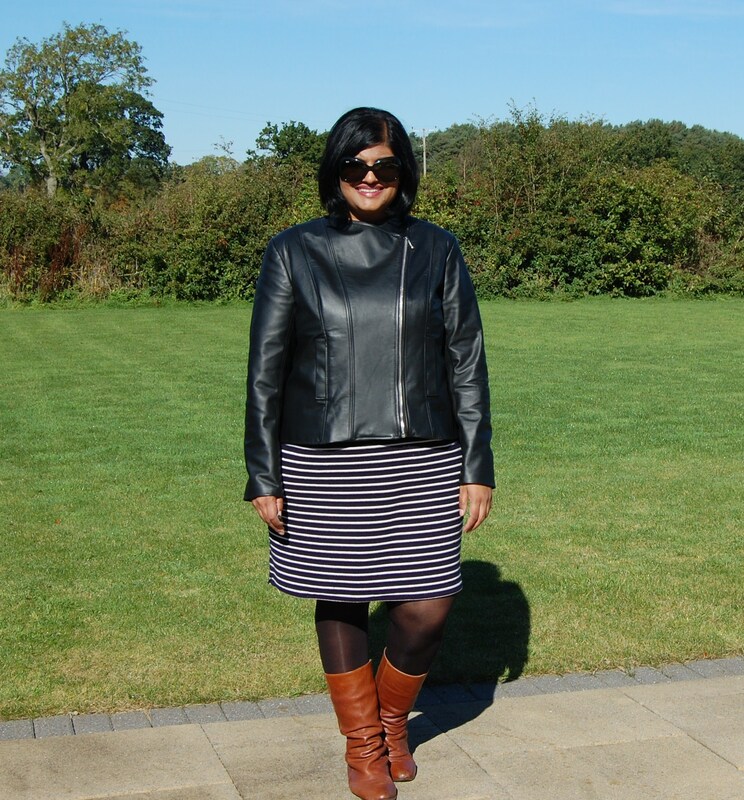 I made a leather jacket a few months back and it certainly did test my sewing skills. Fabulous job with this jacket! Enjoy it! Your jacket is awesome! You did a great job. I’m blown away by your good work. I have that pattern, but I think I will make the jacket out of something a little less intimidating:) Thanks for all the sewing tips, too. Thanks Angela. Whatever you make this in its a great little pattern. How did you know to do all of those tailoring tricks? Have you taken a tailoring class? Thanks Tasha. No I haven’t taken a tailoring class but I used information from two books that I really recommend: one is the book in the post above (fit for real people jackets) and the other one is this one: http://www.amazon.co.uk/Tailoring-Classic-Perfect-Updated-Revised/dp/1589236092 if you haven’t got them, get them! Bravo! I have this pattern and am waiting for just the right fabric. You did a great job! OMG!!!! What a fabulous jacket! You did such an amazing job. I have a jacket just like this, but…yours is real leather and you made it! Mine is merely pleather from the Jessica Simpson collection. Kudos to you! Wow- impressive!! The final result is so worth all your hard work! Impressive! Looks beautiful, and beautifully made! Your jacket is just so cool and fabulous. Great job – wow! Wow! 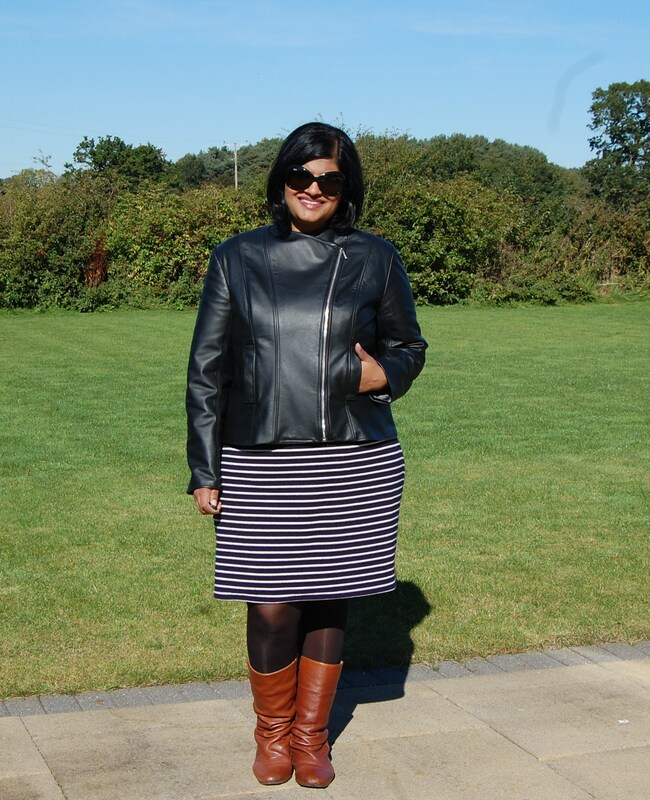 Manju, this jacket is absolutely stunning. The fit, the construction, everything is just so brilliantly done. It is, hands down, one of the most impressive sewn garments I’ve ever seen. Well done! What a beautiful, super cool labor of love. Beautiful, You inspire me to give it a try. You must feel fabulous when you wear your jacket. I hardly know what to say. This jacket is stunning in every way. And on a side note about the pattern, I am thrilled to see how few adjustments there were to get such a great fit. This pattern is in my stash and I am now more encouraged than ever to give it a go. Every time one of your pattern reviews pop up, I smile, knowing I am about to get a big old dose of inspiration. Thank you Rebecca. It really is a great pattern. Your very adventurous project has turned out fabulous. Thanks for sharing the process. Beautiful work! Thanks Rikki. I am sure you could handle leather. Fabulous jacket, and outstanding workmanship! Also, great tips on the leather and thread. It looks very good on you! 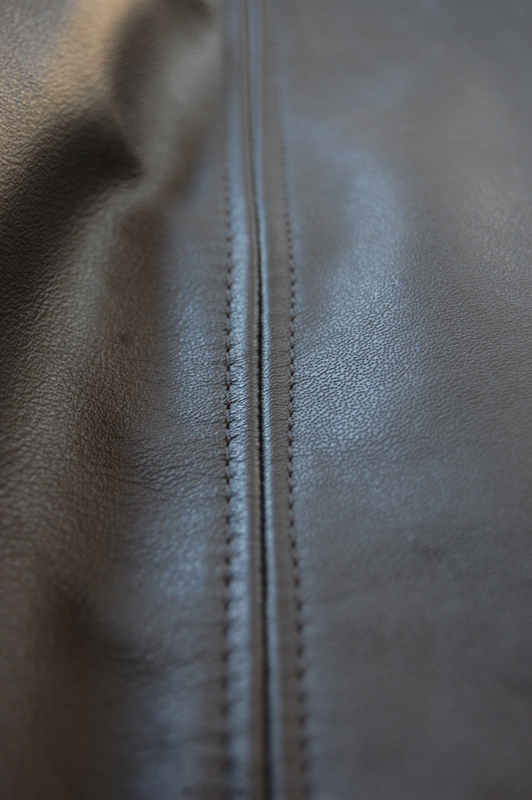 Leather is so unforgiving but its such a lovely natural product to sew with. Beautiful work! I love this jacket on you! Now that you’ve mastered one, don’t you think another is in order? LIke a cool and funky color? Or maybe snake skin? Maybe even a color blocked! The options are now endless! Great job! Ha thanks Myra. Yes. Maybe another one will come along but not for a while! 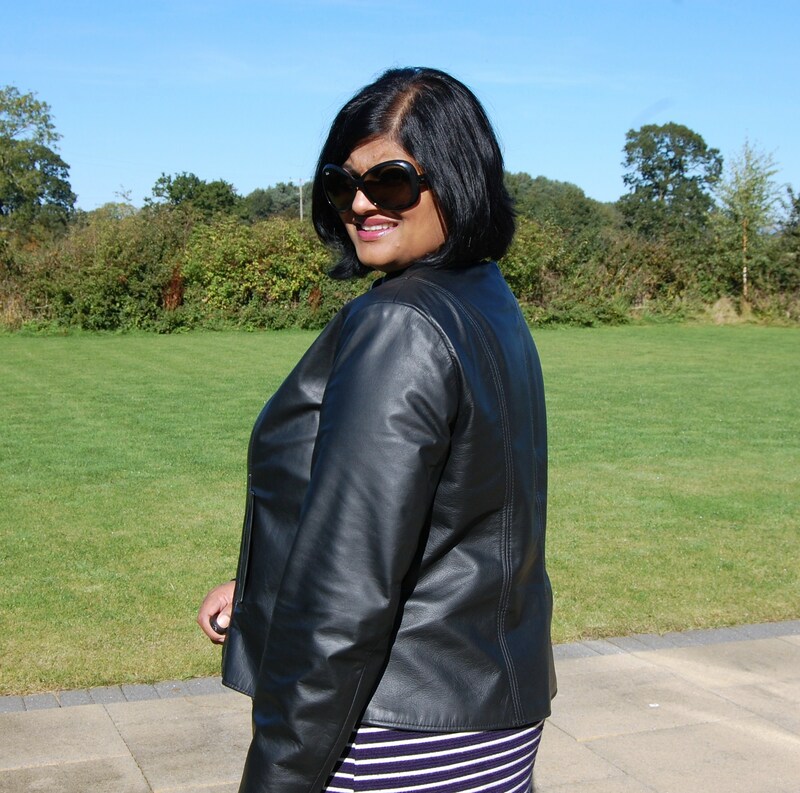 Awesome job on this jacket Manju! I’ve not braved a jacket yet but want to at some point. OMG! you did a fantastic job on your jacket. The leather looks soft and beautiful. Job well done. Thanks Alethia. 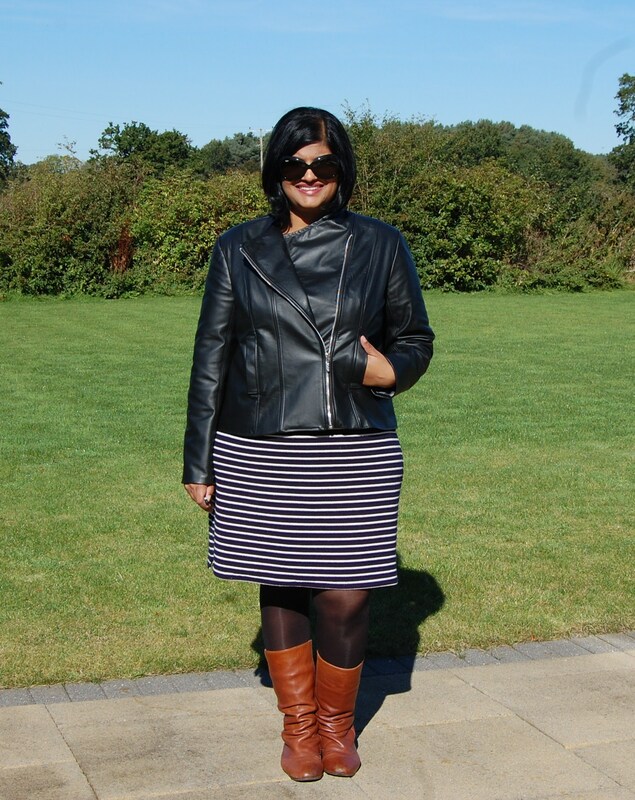 Yes the leather is soft but not so soft it was difficult to sew with…nappa may have been too soft. Great job! I just started sewing in May and it is very inspiring to me that you have gotten so good in a relatively short period of time. Wow good job , I am just like few other women on here we have some great prices of fabric Sat on shelves just waiting to be stitch up , but have lost our confidence in turning fabric into somethink lovely. But reading all replies on here I feel that you all given me confidence to at least give it a go as they say nothing gained nothing ventured. Definitely you should take your lovely fabric and just do it. This leather has been sitting on my shelf for at least 6 months. Much more lovely now it has been sewn up. You and your jacket LOOK AMAZING!!! I would love to try a leather version, but not until the new year! Beautiful job! 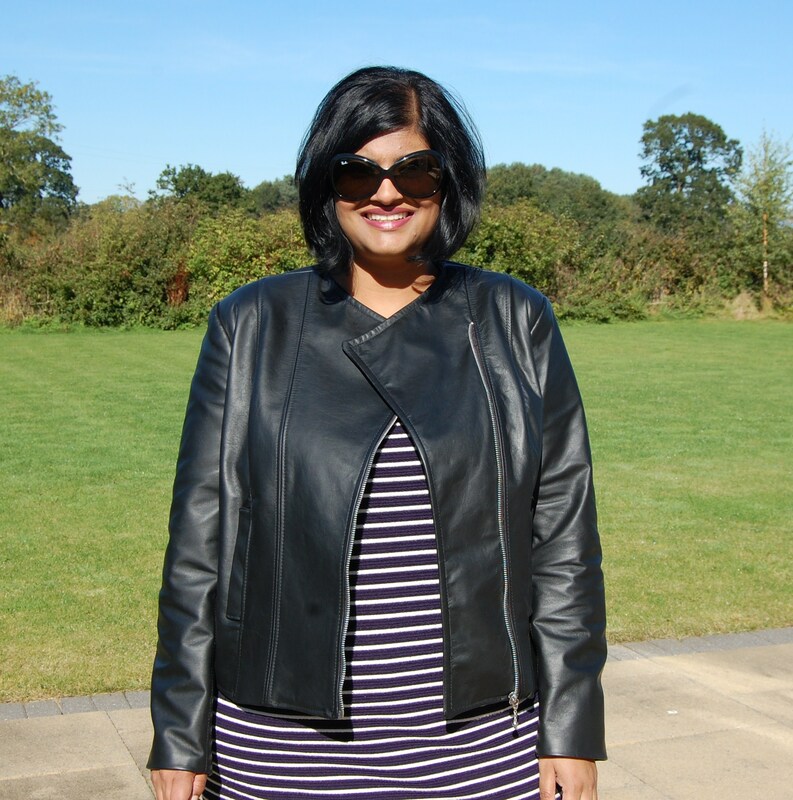 I’ve have only tried leather on the sleeves of my Morris Blazer and it was fake leather. That is really impressive! I love that pattern, have made it once, and am making another one right now…uh oh. Now I want a leather one! Wowsers!! Your jacket is absolutely amazing!! Wow, great work! Thanks for the sewing details. I won’t be working with leather anytime soon but these hints are good to know. You really knocked this one out of the park! It is absolutely beautiful!